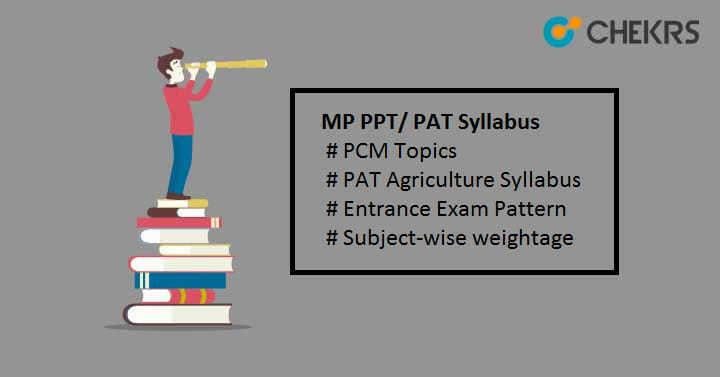 MP PAT/ PPT Syllabus 2019 Pdf: Candidates aiming to take admission in polytechnic or agriculture courses through MP PPT or PAT need to gather all the exam stuff like syllabus, notes and important books to excel the exam by obtaining maximum marks. The exam syllabus is very important things to know before exam as it will help you to know what to study, what not to, subjects-wise topics etc. You should also check the Exam Pattern to get familiar with the original question paper. Here we have provided the official prescribed exam syllabus to help you. Electric current, Ohm’s law, Kirchhoffs laws, etc. Food preservation-Methods and importance, etc. Fruit and vegetable preservation, etc. Candidates aiming to give MP PAT exam should check the MP PPT Entrance Exam Pattern before the exam to clear the doubts related to the question paper. With the help of this you can observe mode of examination, marking scheme, and difficulty level of original paper etc. Duration of Exam 3 hours, 2 sessions, i.e. morning & evening. Marking Scheme Candidates get 1 mark for each correct answer. Candidates can also check given below paper pattern to know the subject wise weightage, scoring topics etc. The question paper will contain questions from the class 11th & 12th subjects. So take a look on the syllabus of different courses and prepare yourself accordingly. For more details and query, you can drop your question in the below comment section. We will help you for sure. All the Best!! !